The only thing that looks more refreshing than an ice cold Buzz Cola is a frozen Squishee (extra syrup), but you don't have to visit Springfield, U.S.A. to try either now, because the first, permanent Kwik-E-Mart from The Simpsons has opened in Myrtle Beach, South Carolina. And it's just the first locale from the series coming to the area. SimEx-Iwerks Entertainment opened their replica of Apu's store (which we first saw at CBR) on August 17, and in addition to selling tons of Simpsons memorabilia--including t-shirts, stuffed animals, magnets, glassware, key chains, and more--fans can dine on foods and beverages based on the show. Customers can wash down a Heat Lamp Dog with energy drink versions of Duff Beer and Flaming Moes, or choose from a variety of Squishee flavors to help them finish off an oversized Lard Lad Donut. There's also a sign above the door with Apu's customary farewell, "Thank you, come again!" as well as plenty of photo opportunities both inside and out, with character cutouts to make it feel like you're really in Springfield. This is just the beginning of the company's The Simpsons in 4D attraction. They also have plans to open up their very own Aztec Theater next door. 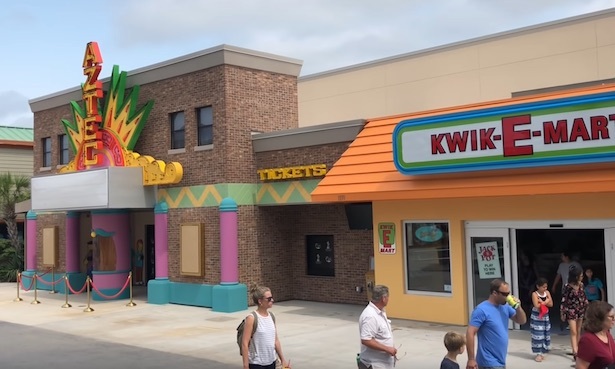 It will include "a fully themed lobby and theater experience rich with detail," and will open later this year with a red carpet featuring the Simpsons family. You can get updates on how to get tickets here. We've waited 30 years to try a real Squishee, and now that we finally have the chance we know exactly how to describe how we feel. Which Kwik-E-Mart product are you most excited to try? Tell us in the comments below.